An Old West-themed "saloon", this eatery serves up down-home, casual, American fare. 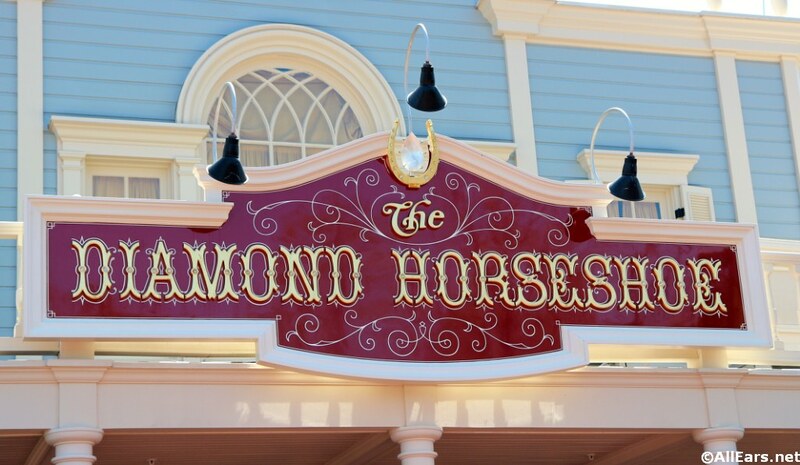 UPDATE May 2018: The Diamond Horseshoe in Magic Kingdom's Frontierland debuted an all-new menu on May 23, 2018. On the a la carte menu there are new sandwiches, such as Carved Beef Brisket Sandwich with creamy coleslaw served on a brioche bun; Creamy Turkey Salad Sandwich on multigrain bread with lettuce and tomato; Grilled Chicken Thigh Sandwich with BBQ mayo, lettuce, tomato and onion served on a Kaiser roll; and BBQ Pulled Pork Sandwich with mac and cheese and crispy onions served on a brioche bun. You can also get the Mac and Cheese alone, with bbq pulled pork, crispy onions, and green onions. There will be several platter options, which are served with your choice of two sides and cornbread: Carved Beef Brisket Platter, the Smoked BBQ Pulled Pork Platter, the Grilled Chicken Thighs Platter. There's even a Vegetable Platter with a choice of four sides. Diamond Horseshoe will also offer a limited range of American beers and wines for those age 21 and over.